Two fusion spheres must be brought together to begin production of energy important for powering Neptune’s military systems. Bring the spheres together by creating a pathway. Pick up the bumpers and collide them with the colored cubes to move them into position. 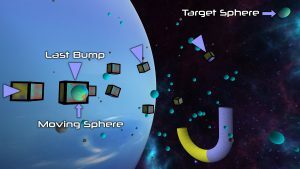 The cubes will direct the Fusion Sphere along its path to the target Fusion Sphere. If the Sphere strays off-course it will be destroyed. Initially, there is a cube that prevents the Fusion Sphere from moving. Once the track is set up properly, move the blocking cube (marked by “Bump Last” in the diagram) to set the Sphere in motion. The figure displays the four bumps, along with the bump directions, required to set up the course properly.